My husband always made me feel loved. Even when we had fights, even when I cried & ranted & knew he was putting up with me. Even when I felt like he didn’t like me. Even when I was so mad at him my vision was shaking. Even when he was sinking into depression and absolutely nothing I did seemed to make an atom’s worth of difference. Through all our hard times, through all our fights, I always never doubted, that he really truly loved me. He never spoke of his love for me like this great fortress that would comfort me (like my favorite love song in High School “All I ask of You”). He didn’t really speak of his love for me at all. Just listened when I rambled about my fears and worries till 2 am, just listening. Told me when he thought I was wrong. When I asked him “Why do you love me?” He thought about it for a bit, and came back with “A combination of me wanting to, and feeling like God wanted me to.” God wanted him to love me (and he didn’t mind). That was reason enough. And as un-romantic as it was against “you are the most beautiful woman I ever met” “your soul is so beautiful” etc etc, it was rock solid. Because no matter how many fights I pick and doors I slam and meltdowns I have, no matter how I nag him and worry about finances and act shabby in petty fights with other girls or get fat, that doesn’t change, that God wants him to love me. And that he would love me, with God’s help. So why did he love me? Because God told him to. And it wasn’t a “my great love I have because I’m obeying God.” He loved me. It just was. In the thousand little things, his confident order of 2 beefy-5-layer burritos at Taco Bell, the 2 player games of 7 wonders, his grin when I solved the programming question, the berry-peanut butter sandwiches he fixed for our picnic, him talking to my tummy, explaining to our breech in utero baby the reasons why he should flip over…. It was a sort of un-self-conscious kind of love. It was just there---like the sun coming up. “Why does the sun come up?” the 3 yr old asks. “Because God wants it to” you say, thinking about something else. But it’s true. And it does come up. He was never my savior, my rescuer, my rock. He pointed me to the One who was. Early in marriage, at first I was a little deflated by this. He wouldn’t usurp Jesus’ place in my heart. Because he was right. No human can comfort as we crave comfort. No human can really be your rock. No human can really be the Bridegroom of your Soul. It might work for a bit, for a few months, perhaps even a few years at most. But it will crumble, the idol will crash down, the asphalt will break under the load that was meant only for unbreakable Rock. I had always found the “Let me be your shelter, let me be your light” motif from All I ask of You to be so romantic. The girl, full of fear, falling apart, the guy, strong and full of love, making it better. But then, viewing The Two Towers movie, I saw the same motif, but gender inverted. The war seems to be teetering on the edge of destruction, evil seems to be winning. Aragorn has been fighting this for 60 years, and now, he is struggling with giving into despair, doubt. 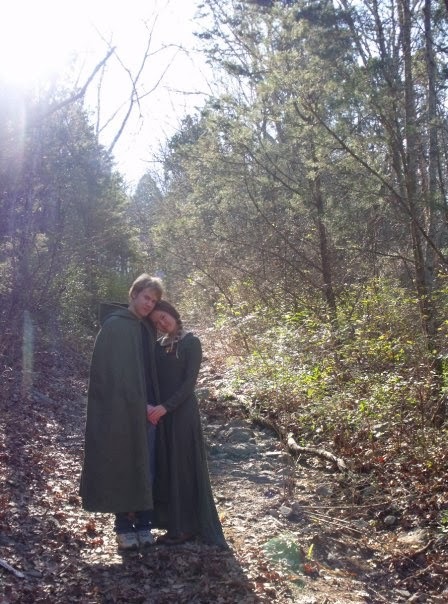 In this dream sequence he sees his beloved Arwen, and tells her “My path is hidden from me.” To which she says “It is already laid before your feet. You cannot falter now.” He looks upset, is trying to say something, she silences him and says “If you trust nothing else, trust this (pointing to the necklace she gave him, the symbol of their love) Trust us” and then they kiss. I was dumbstruck with the depression of it all. He’s struggling with doubt, struggling with despair, not even knowing if he’s doing the right thing. She tries to tell him that he is, and he still isn’t buying it. So her trump card is, if you believe in nothing else, believe in us. And now I realize it reminded me of this poem. The funny thing was, when the girl’s love had to be the light, the shelter, it struck me as so insufficient, such a pathetic human attempt to hold our frail love against the darkness closing in. Admirable, but so incredibly sad, weak, and doomed to failure, like a toddler trying to move the piano on willpower. Eowyn is where Aragorn was. She’s despairing that the darkness will win. That the light will never come again “there is no warmth left in the sun, it grows so cold.” And Faramir’s response? “It’s the damp of the first spring rain. I do not believe this darkness will endure.” And he says it, so full of faith. And then, she puts her head on his shoulder, his arm around her, while he looks out toward the light. In the Aragorn/Arwen scene, LOVE what was gonna get them through it. “Believe in us.” The scene ended with them, face to face, desperately trying to get their strength from each other. 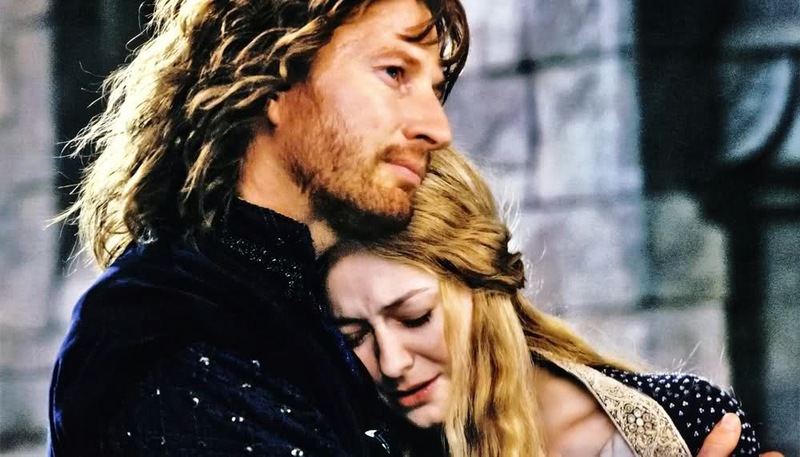 In the Faramir/Eowyn scene, “I do not believe this darkness will endure”. Believe that the sun will come again. The scene ended with him looking out toward the light. Faith. Faith in something bigger than yourselves. Both scenes are about people comforting each other. In the first, Arwen’s love is the final answer. In the second, believing that the light will come, is. If a human tries to be another's light, shelter, savior…its going to fail. He might really really mean it. He might really really try. But he’s going to fail. Because humans aren’t God. There’s a God-craving in us, an intense missing something we’ve never really known, desiring the Perfect Father, desiring the Bridegroom of our Souls. And we try to fill it, fill it with fellow humans, or daydreams. And it doesn’t work. Because that vacuum was designed for only one Man. For the Real Bridegroom of our souls. And He’s the rescuer for both of you, you and your husband, as you journey together, selected for each other because God wanted you 2 on a team, together traveling on that road to the New Jerusalem, where the Bridegroom of your souls waits, where the deepest desires of our hearts are filled. Because they weren’t meant to be filled here. They were meant to be filled in the New Jerusalem. And they will be. As sure as the sun rising in the morning. This post is on #7 Back Scabbard and #8 quiver and #6 belt. 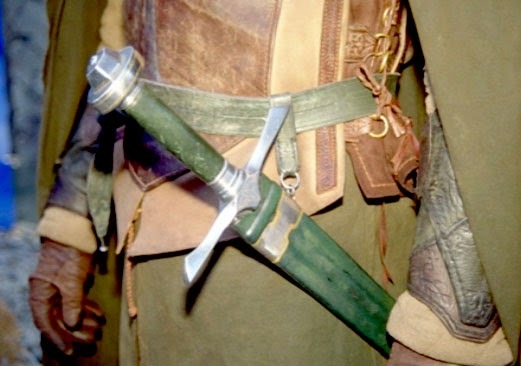 We will look at Faramir's Scabbard (hip), and Link's Scabbard (back). We see its a main belt, with 2 straps coming off of it, the first a short strap to the top of the scabbard, and the second strap looks like it may be adjustable, about 1/3 way down the scabbard. 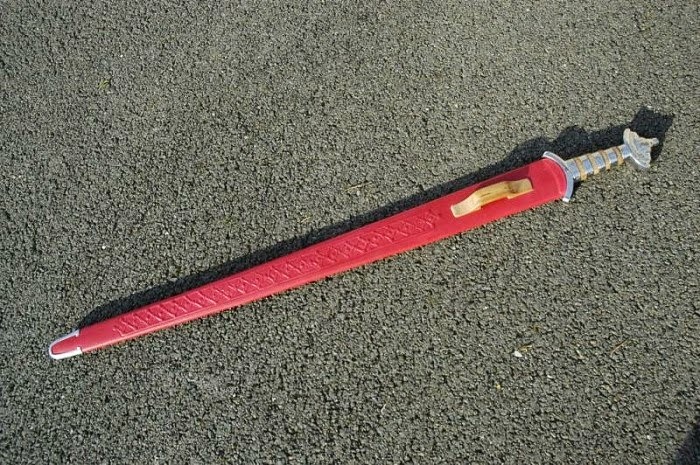 This is to keep the sword from swinging willy-nilly on your belt when you run, etc. If its adjustable (I think I see a small buckle there) it allows you to adjust the angle it hangs for a quick draw. 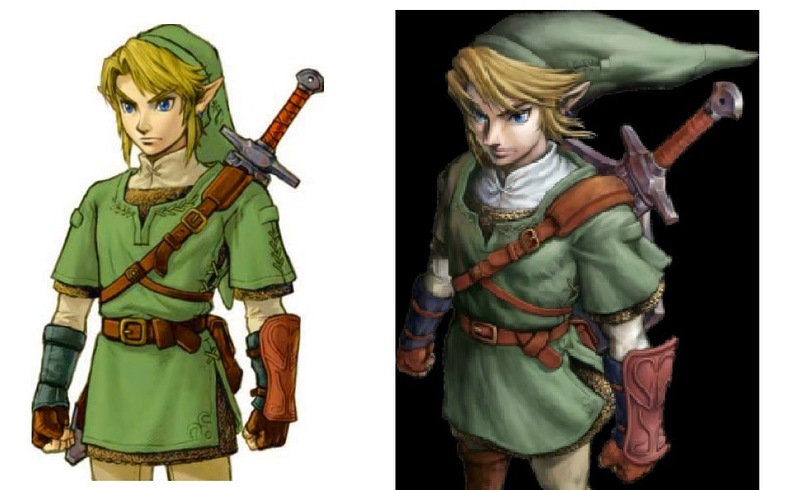 Link's scabbard is a back scabbard. It's basically a main belt with a smaller strap riveted to the belt in 2 places. 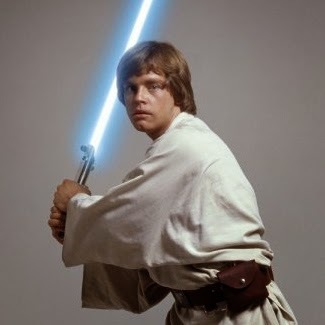 The main belt goes over his chest and over one shoulder and down his back. There is some sort of leather shoulder pad to distribute the weight better. (Especially as I think he also hangs his shield on the strap across his back). 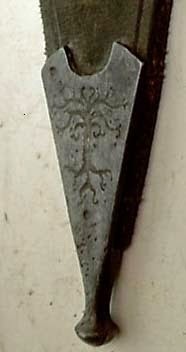 Then there is a strap that is riveted onto the front and back to keep the scabbard stable. It runs from his center chest along one side at the same height as the main belt on the other side and joins back to the main belt at center back. 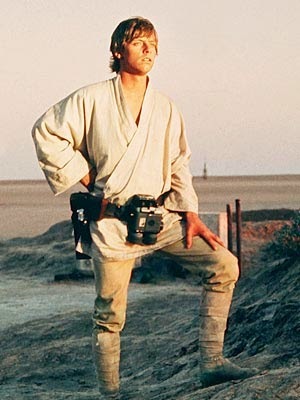 The smaller strap is an attempt to keep the weight bearing belt out on his shoulder, and prevent it from crawling up and pinching his neck (as any mom knows who as improperly worn a baby sling). To me it seems an attempt to partly correct the assymetrical design and even out the weight a bit. Assymetrical is uncomfortable. (As any mom knows who has worn her baby in a Shoulder sling vs a Mei Tai carrier). 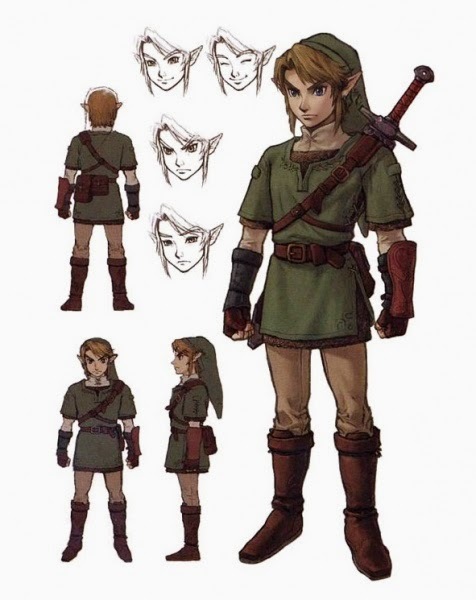 Especially given the weight of his shield, I think it would make more sense for Link to wear 2 belts like an X across his chest, riveted together mid-chest and mid-back. (I'm pretty sure I've seen this style in Skyrim). But then maybe Link wants his sword arm's shoulder to be unburdened....beats me. So both of these scabbard's strap systems are totally doable with leather brown belts, some leather straps, rivets, and a few metal rings and fittings. THIS GUY (YE OLDE GAFFER) IS AWESOME. He shows you how to use simple slats of wood and your sword and some simple tools to make one of these. Then I found links to making your own chapes (the sword fitting on the tip of the scabbard HERE and HERE) So that's totally what I'm doing. Once I have a sword. So until then, I'm going to make strap systems that hold other things like pouches, shields, and quivers. 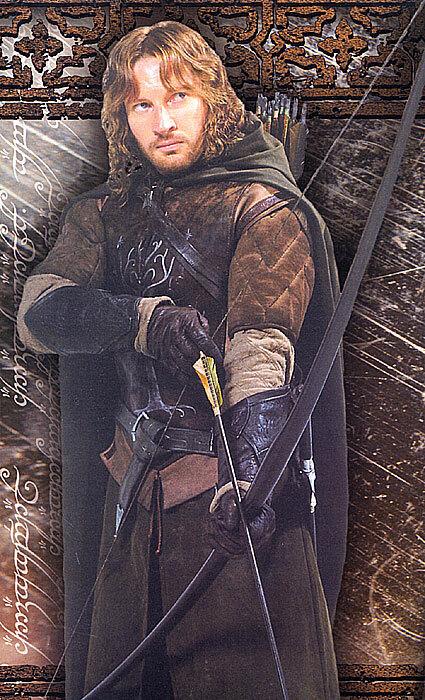 So it seems that Faramir's Quiver is simply a cyndrilical holder (holding a bag) attached to a simple loop belt worn slung over one shoulder across the chest. Slung across the front, with cloak. 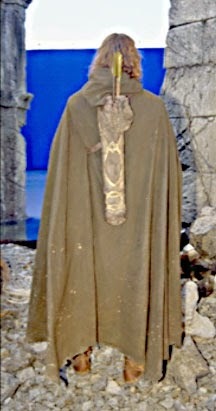 Notice how it goes up over the cloak on one shoulder, and underneath the cloak on the other. Note how the strap is creeping up and digging into his neck (this is why Link had that extra strap.) Ofcourse the weight of Faramir's quiver is a lot less uncomfortable than the weight of Link's shield and sword. I think I'm going to improvise an extra strap like Link's to keep it from riding up like that. Plus extra straps just look cool. 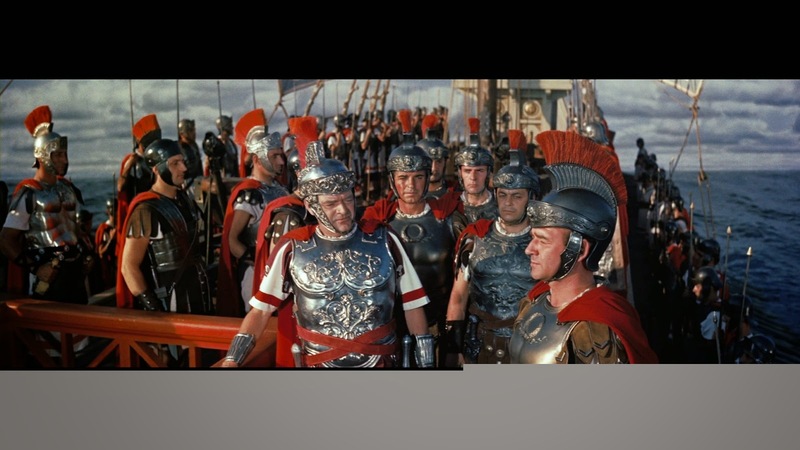 See how I highlighted the strap with red on the left image. It comes over his cloak on one shoulder, and then attaches to the quiver, and then into a slit in his cloak and around his body joining in a buckle on the chest. 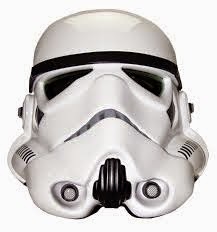 But instead of the bottom strap attaching right at the base, it would be somewhere mid-cylinder. And ofcourse the cylinder part would be gussied up to look like Faramir's. 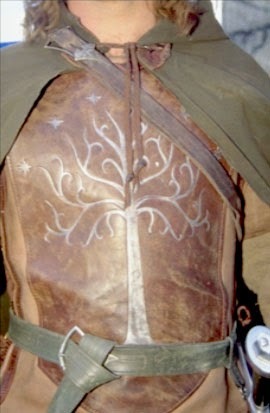 Faramir's belt is a regular belt but with a really wide fan shaped buckle. "Were any of them this cute!?" It's not that she thought that the new babies were cuter, its that her mind was on overload from the over-maximum threshold of bearable cuteness, and that phrase was just showing that her brain was short-circuiting. For the human mind can only contain a certain amount of cuteness, after which it short circuits, is overwhelmed, and the memory cannot contain it. And thus, we retain only our maximum level of bearable cuteness in our memories. And we cannot be trusted to be using logic, nor memory, nor competently speak the English language, in a moment such as that. The ever popular SIBLING PICTURE! Baby gets that she's supposed to be smiling, but doesn't know in which direction. Isaiah is oblivious, Jenny don't care. Baby gets that she is supposed to be smiling and now knows in which direction. Isaiah is oblivious. Jenny don't care. Isaiah gets with the program, just as Baby decides to leave it. Jenny don't care. Isaiah upgraded from high chair to booster chair. 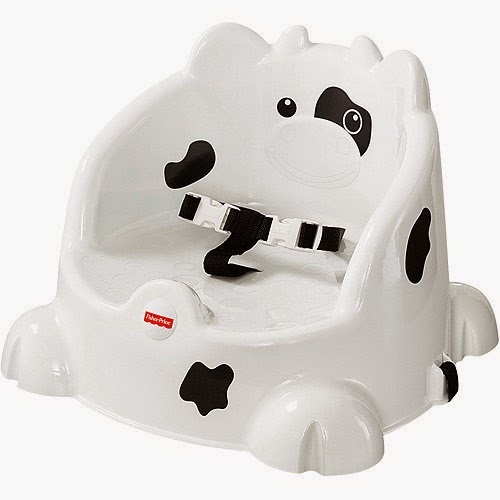 We bought him a cow one from Walmart, as it was the cheapest. Isaiah hates change, and was not sure what he thought of it. Then Jenny christened it the "Stoymtoopey cheh"
Save time and energy, by teaching on a 4 year cyclic pattern for 5 reasons. 1. I’m a perfectionist. Knowing that we’re coming back to this subject later, frees me from the terrifying thought I’ll mess it all up forever, and allows me to actually move and do something. 2. With multiple kids, all doing multiple things, I can’t teach everything at once. Realistically, if kids are all doing different histories, we’re just going to end up doing bare minimum. 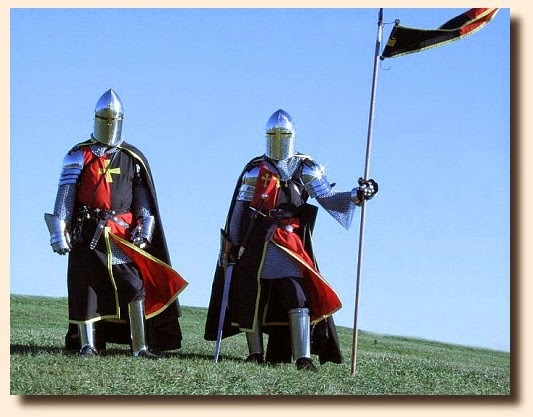 If its cyclic, however, and we’re all doing “Medieval History” at once, we can learn together, e.g. have a medieval feast and have the big kids plan it and research it, and the little kids pitch in and help make the sweets. Or the big kids could plan and do hands on projects that they teach the little kids from their time period (grinding wheat, map making, FLETCHING ARROWS, etc). And the big kids could solidify what they’ve learned by teaching it to the little ones. 3. As you could see with 2, there’s a lot of peer learning that will go on. Less work for me, Yayy! 4. We could do field trips and lengthy experiments/projects together, which would be justified in how much time they use up because its for everyone’s school. Here are the toddler R2D2 Costume and toddler Luke Skywalker Outfit that I made last October. Thankfully, I made the R2D2 dress roomy enough that I could still get it on Jenny. The only way I could bribe them into letting me take their pictures was feeding them peaches. Jenny was thrilled to wear her "Aw too dee too dwess", but Isaiah threw a fit about putting on his Luke Skywalker costume. The result was I just sort of stuffed him into it, and didn't get to pin it or anything....so its kind of falling off. Sigh. Here are the pictures, courtesy of peaches. Now rejoicing over peaches received. You get a better idea of the R2D2 toddler dress here. My little runaway R2. If only toddlers had a restraining bolt.